This was a day of training for the Seattle Marathon: a 13-mile run on the logging roads punctuated by a couple thousand feet of Class 3/4 scrambling on wonderful dunite to keep it interesting. Time: 2.5 hours from car to summit, 2.25 hours from summit to car. Twin Sisters Mountain is very unique in it's geology. All but the last sentence of the following paragraph is taken verbatim from Roadside Geology of Washington by David Alt and Donald Hyndman, pg 265: Twin Sisters Mountain is one of the most extraordinary bodies of rock in the the country. The mountain, which is about 10 miles long and 3 miles wide, is a solid mass of an extremely rare rock called dunite, which consists almost entirely of the mineral olivine. Dunite properly belongs in the mantle, and is greatly out of place in a continent. 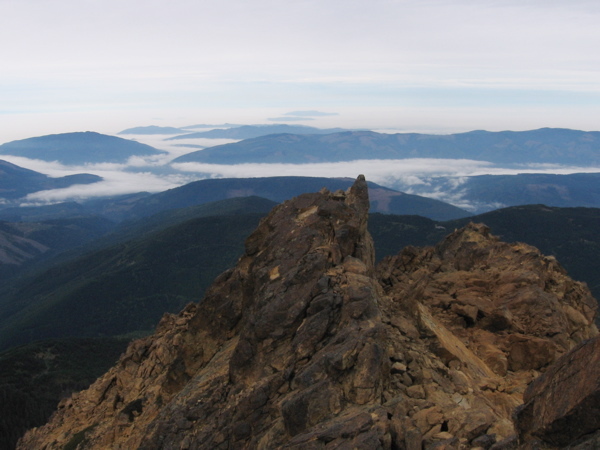 The fresh rock is green, the color of olivine, but it weathers to the rusty brown color that makes the ragged top of Twin Sisters Mountains conspicuous from a great distance. This rock is solid and grippy, and great fun for climbing. 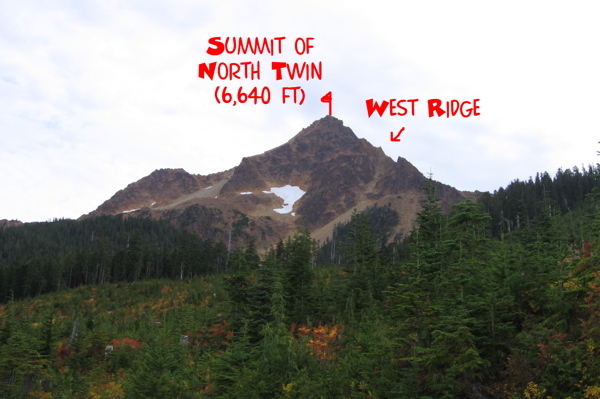 My brief laptop mountaineering of the North Twin indicated that several climbers have had trouble staying on the correct logging roads on the approach. So in the below trip report I have included some detailed directions (read if you want). I have also included some of my photos from the climb. Enjoy! I have attached a map (Beckey's guide, pg 40) below that shows some of the roads, as well as the trail network. Basically, you need to get on Mosquito Lake Road, either from Acme or Welcome, WA. Just north of where Mosquito Lake road crosses the Middle Fork of the Nooksack River (about 6 miles from Welcome, 10 miles from Acme), a well-graded dirt road (Road 38) branches off to the west. Take this road. At about 4.5 miles you will come to a bridge over Clearwater Creek. Shortly after this, take the right fork down to the river (Road 38 forks left). There is a gate just before the bridge over the river. 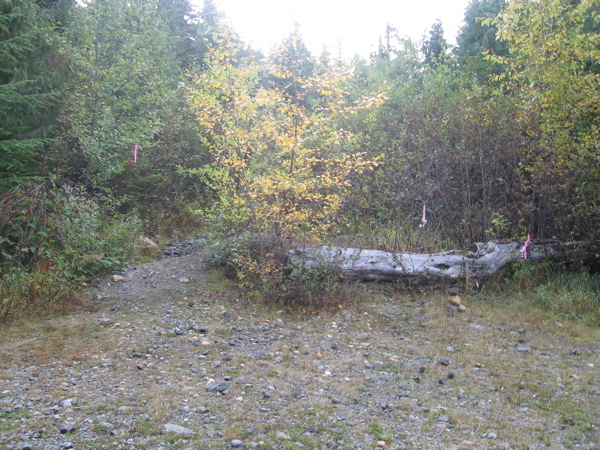 This gate is usually closed, so park here and begin the hike (or bike) up the logging roads. Click on the map for a bigger view. I have outlined the route from the gate to the summit, and added some notes to help with route finding. Printable at 8.5x11. Note #1: Unless you prefer hiking or you plan to run the logging roads, I would suggest bringing a bike to ride down. The roads are well-graded and would be lots of fun (and much faster) to bike down! Note #2: The following route description was updated in 2010 when a friend pointed out some minor changes in the logging road approach since I did the route in 2006. As is typical in the mountains, route details are always liable to change, so take this info with a grain of salt that grows larger with each passing year. Cross the bridge and hike/run/bike/push bike up a well-graded logging road. After 2.6 miles (took me 30 minutes jogging), the road forks. Take the right fork. Don't be tempted to continue along the main logging road (marked by a sign, "9070"), since this goes to a quarry. This logging road, the right fork, climbs gradually through a recent large clearcut. About half a mile after crossing a stream on a sturdy bridge, the road forks. Take the left fork. About 0.35 miles after the bushy road you don't want to take, just past where the road starts downhill, look for a trail that turns off the road to the left (see photo below). There is a dirt mound, dead tree, and cairn. Only climbers make cairns, so this must be the trail you want! It is about 6.5 miles from the car. It took me 1 hour jogging to get to here from the car. The trail is narrow for a little bit, but then widens to an old road spur and switchbacks through a clearcut. Where the road spur comes to an end (this is where I would stash a bike), head leftwards past a fire ring and find the trail leading through brushy clearcut to the timbered ridge. Where the trees end (1.5 hours from the car for me), just follow the ridge all the way to the top. Don’t worry about following a trail or route description here, just go wherever your arms and legs lead you. Happy scrambling! For the descent, I just descended the ridge and got back on the trail. In the earlier season, there is enough snow on the north side to just glissade back down to the trail. The route up the West Ridge as seen from the clearcut area. Looking up towards the obelisk on the West Ridge, about halfway up the climb. 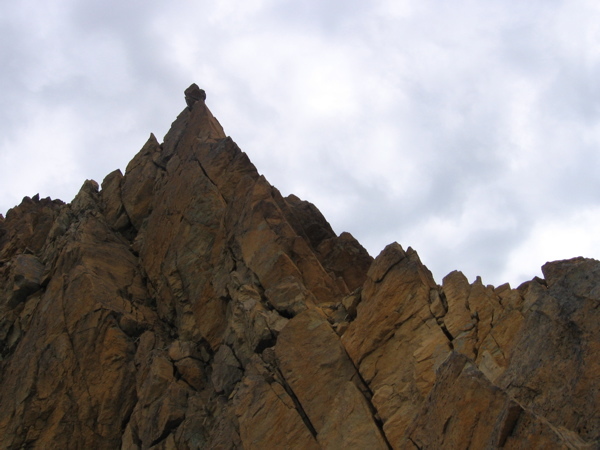 The Twin Sisters are actually the largest body of exposed olivine in the Western Hemisphere. The rock is called dunite, and it is super grippy and is some of the best climbing rock in the North Cascades (Beckey, pg 41). The view west down the west ridge. The climb gives a great view of the San Juan and Gulf Islands. 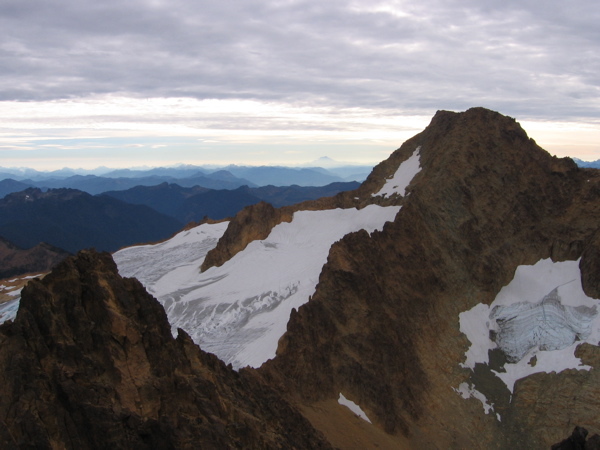 The South Twin Sister and the North Cascades from the summit of the North Twin. I got to the summit in 2.5 hours from the car. Looking down the North side of the North Twin from the summit. In the earlier season, a good descent route is to glissade down the north side of the mountain, but without the snow cover it looked too loose to be much fun, so I just descended back down the ridge (1 hour from summit to treeline for me, 1 h 15 minutes more to my car (now I wished I had a bike to bomb down the roads! )).